Well, seeing as my attempt at an afternoon nap is shot, and seeing as I am sick of doing housework this weekend, and seeing as I have hit a plateau in caring about the book I am reading (which really is good, but I have walked away from it so many times in the past week that I seem to have forgotten just how good it is), it might as well be now that I mention these little gems before the urge to do so fades. 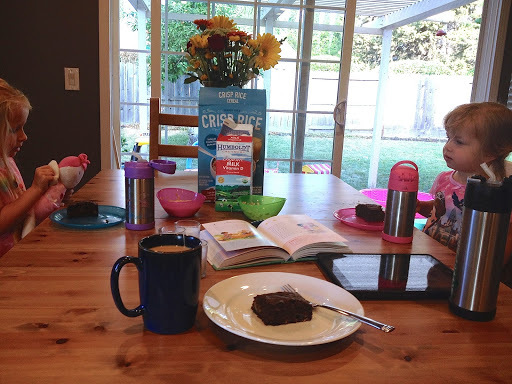 But of course, after you headed back to bed for a mid-morning nap while I sat down to a cup of tea and the last bit of that Chocolate Banana Bread I’d made earlier this week, those girls were practically stealing my breakfast off of my plate, acting as if they hadn’t been fed in days. Without much to go around, I felt like I should have put in the effort to make those darn pancakes after all. Tomorrow, I promised myself. This morning Addie was up at 6:00 as usual, and I somehow managed to whip together a handful of ingredients to make these bare-cupboard friendly pancake/crepe-like things. And you know what? I am just going to start calling them crepes because they are much closer to a crepe in character than they are pancakes. And honestly, I bet they would be perfect rolled up with sliced bananas, strawberries, and/or chocolate or and topped with some whipped cream or powdered sugar (but then they would not be so bare-cupboard friendly, would they?). This batch was perfect–perhaps the best I have ever made. They tasted just like the crispy, sweet crust of classic french toast. And wouldn’t you know it, after all that, neither of the girls were interested in them for breakfast until you got up and started munching on them. By then, two hours later, they were cold. (I can’t win.) But I promise these French Toast Crepes (as I am now officially calling them), do win when they are fresh from the griddle. I admit I did not come up with the idea for these on my own. 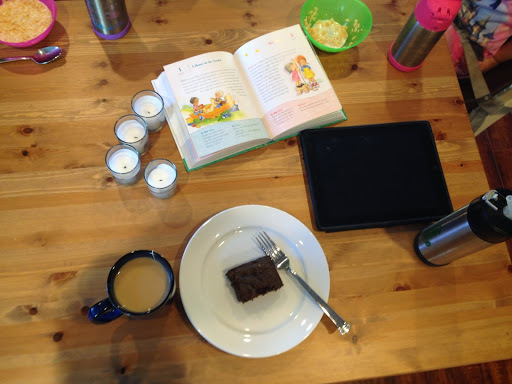 I first read about making pancakes out of pureed bananas and eggs on Shauna Niequist’s Facebook feed. Until then, I hadn’t heard of them. But apparently they’re all the rage and you can find many versions of them. 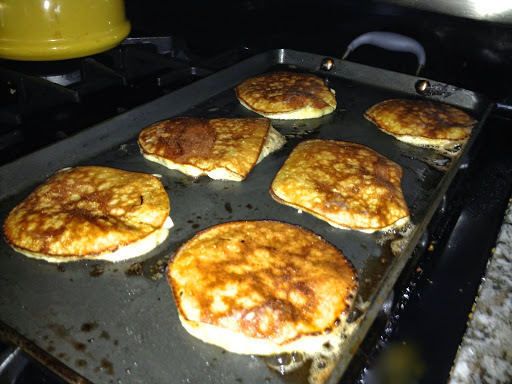 Hers are the simplest: pureed bananas and eggs whisked together and cooked like pancakes. Joey and I liked them well enough, but Joey suggested tinkering around until we found the right concoction to make them taste a little fancier. Cinnamon, vanilla and sea salt did the trick. I used to slather the griddle with butter, but have switched to refined coconut oil due to Emery’s dairy allergy. I still highly recommend using butter (because, YUM. ), but refined coconut oil does the job well too. 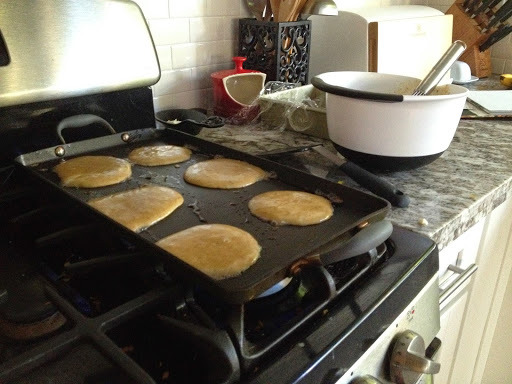 Heat up your griddle and plunk a knob of coconut oil on top, about a half tablespoon per batch or so. Pour the batter onto your hot griddle and cook on medium-high heat. I usually use about 1/4 cup per crepe, but you may certainly make them as big or small as you like. Cook as you would a pancake–look for the sides to firm up a bit, and for bubbles to rise up a bit in the center. They won’t bubble as much as traditional pancakes, so watch them carefully. Flip when they are golden and cook for another two minutes or so. Serve as you like. We like them right off the griddle as a quick hand-held breakfast, but I’m serious when I say they’d be amazing stuffed with something sweet and topped off with something even sweeter.